Usually, when you think of a dog prancing down the yellow brick road you think of Toto but your pooch is about to change all of that! Check out this Dorothy Pet Costume. Now, your pup can take on the lead role in the amazing story of a small town Kansas girl’s adventure through a mysterious magical land. This ensemble is as easy to assemble, as it is charming. Simply strap this adorable dress on your dog with the help of the Velcro, tie the cute bow around her head, and slip her little paws into the included booties and you’ll have the most precious doggy in town. Just watch out for any wicked witches that try to steal your little dog away from you! 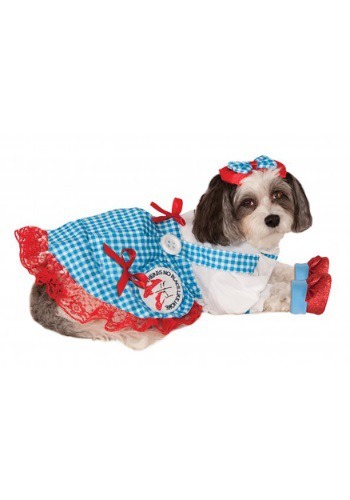 Let your furry little friend join in on the fun this Halloween when you grab her this darling Dorothy Costume. Take her around the block when you’re dressed as your own favorite storybook character. The two of you can bring a little bit from the land of Oz to your neighborhood this Halloween together! But again, please do be cautious of that wicked witch and her minions, she really has it out for poor little Dorothy.